Are sleep-deprived engineers hurting the Web? An interesting read on the sleep conditions of those creating software for the web. Check out the link at http://www.jr.co.il/articles/sleep.txt for the full story. Found a cool article on how they are using robots in hospitals now. Click here to check it out. Quite the new craze. And rightfully so, as it closely relates to human behavior in the real world. We like to use networking to find people we trust. Ultimately, that is what it's all about: trust. And there are levels and degrees of trust. The best level is a referral by someone your trust very well. You are very likely to trust the person they referred as well. This is "word of mouth" referral translated to the internet. It is brilliant and it is here to stay. Here there are. Interesting to say the least. Here's a few ideas I found on marketing for pennies. Just came across this great article on office politics. It really hits the nail on the head. It's got some really close-hitting truths in it. Let's play Office Politics! All you need are two people and the game begins. Playing the game of office politics is inevitable. Oh, perhaps you believe that you're above such foolishness, but that's really just one more way to play the game. Office politics is simply human nature in the workplace. If you work with humans -- even if they only resemble humans -- then you are dealing with politics. "If there's more than one person, you've got office politics," explains Rob Sarmiento, a Houston psychologist, also known as the CyberPsychologist. He continues, "Politics is essentially competition. Who's going to get a raise or a better job or special project or recognition." "Change and ambiguity and uncertainty breed office politics," adds William E. Rosenbach, professor of management at Gettysburg College in Gettysburg, Pa. "A lot of office politics involves people who are gatekeepers. They get power from knowing what's going on." And sometimes you have to deal with them to get your real job done. "You're a fool to try to ignore [office politics]," Rosenbach sums up. On that note, pick your game piece and meet me at Go. You win if you don't permanently anger anyone off and you advance in your career. Oh, the rules? Rosenbach explains that one of the definitions of politics is that it includes non-sanctioned means of influence. In other words, the rules are unwritten. You learn them as you go along. Sarmiento recommends picking up hints through networking and observation. Perhaps we'll find a few important rules hidden below. This game requires a minimum of two players unless you're into playing mind games with yourself. Anyway, players include your boss, your boss' boss, co-workers, subordinates, the receptionist, and even the cleaning crew and customers. Rule: Everyone's a player even if they don't know it. Someone low on the totem pole may believe they are too junior for anyone to care what they do or think. Not so says office politics expert Ronna Lichtenberg, author of Work Would Be Great If It Weren't for the People. When it comes to office politics, differing self-interests make everyone a player. Self-interests come into conflict because, "We don't understand why people want different things from ourselves," Lichtenberg says. The next time co-workers start doing odd things around you, remember that everyone has their own objectives and goals. More often than not whatever your co-worker or boss is doing has absolutely nothing to do with you. "The most profound thing to look out for is irrational people. They're doing things that they believe will work out for them in the short run," weighs in Thomas Becker, associate professor of management in the Department of Business Administration at the University of Delaware. Back in school, you were probably happy to get picked for a team, but here in the work world, you'll want to avoid getting into an us vs. them mentality. "You can get caught up in someone else's agenda. You can get enmeshed in something and not understand it," warns Lichtenberg. Rule: Don't get trapped in someone else's game. "Identify different constituencies at work: management, customers, co-workers and subordinates. They each have different needs. Recognizing their needs is a good policy," Becker says about how to play good office politics. "Cultivate relationships with people who'll handle the truth. People tend to get into little groups that reinforce their point of view. You get the most stuck when you keep looking for reinforcement of your own point of view. You dig yourself in and deny yourself options," Lichtenberg says. The grapevine is a living source of important information and can be useful for any working professional. The danger is when office talk blurs into juicy gossip. Sarmiento says you want to avoid the temptation to get down and dirty. Keep any juicy items you hear in a work context. In other words, if you find out a co-worker is drinking heavily at lunch and missing meetings in the afternoon, then that's affecting the workplace and it deserves action. But if you find out that another co-worker is having an affair with someone outside the office, and it's not causing a problem at the office, then it's really not your concern in a professional capacity. While you can gather info and even disseminate useful facts through the grapevine, be careful to keep yourself and your life out of it. "Don't get too personal. You want to self-disclose selectively," Sarmiento reveals. Rules: Be careful discussing personal problems. Don't assume anything will stay secret. I'm sure it's hard to believe, but bosses play office politics as well. Higher ups may have to be polite to each other, but they can and will use their subordinates to battle, without telling us little pawns, Lichtenberg reveals. Sadly, insecure managers may also encourage office politics between factions of their staff, Rosenbach says. Rule: Watch out for boss' favorites or pets. Don't incur their wrath either. "It can be annoying to new workers that these people benefit from the boss' favor. But you need to get along with these people. You have to play the game because a pet in your corner can boost your career," recommends Julie Campbell, assistant professor of business at Adams State College in Alamosa, Colo.
Part of non-dirty office politics involves the power imbalance between bosses and subordinates. Whether you were friends before this person became your boss, or you just think your boss is cool, it is difficult to be friends with the boss. Lichtenberg explains, "The boss is your boss, not your girlfriend. She has responsibility for you. It's a heavy thing." It's not a matter of mistrust but of an unequal power relationship. If your boss is someone you really like, stay friendly and keep in touch after your work relationship has ended. What's the prize in the office politics game? In dirty office politics, it's usually something as petty as the smug accomplishment of bettering a co-worker. Rosenbach paraphrased Henry Kissinger when he explained that office politics can get vicious because the stakes are so low. But sometimes the stakes can be quite high. Play office politics well and you may gain access to the boss' ear, which can boost your career. Play the game badly, and you could lose your job ... or worse. "The worst thing, you could get stuck in your career, in a dead end, blocked," Sarmiento explains. Young workers may have certain expectations that the adult work-world is a place of logical, unbiased decisions, with an ultimate concern for the bottom dollar or the customer. In reality, the workplace is not that different from the petty clique-ishness of high school -- with the addition of two more layers of complexity, Lichtenberg says. At work, you're dealing with real money and people who have the power to fire you. "The essence of politics is look at what's in it for the other person," explains Sarmiento. "You get what you want by helping others get what they want." Rules: Establish affiliations of mutual advantage with important people. People will always be able to refer you to other jobs. Be the good guy who does your job well. If you find yourself in a conflict with another person at work, Lichtenberg recommends changing your strategy rather than waiting for others to change. She advises finding some other way to fulfill an opponent's need. In other words, if the supply clerk makes you run through hoops to get a box of pens, discover this person's motive. Perhaps they feel out of the loop or unacknowledged. In that case, find someway to recognize this person and pay positive attention to them. You may find them less rigid in their bureaucracy. Rule: Keep it professional at all times. Sarmiento recommends accepting office politics as a part of your job. He explains, "Networking and politicking are not distractions -- they're part of the job. Do it in a professional way. Apply the same ethics and hard work to that part of your job." Some folks believe if things are managed correctly, we'll all get along perfectly. That's not possible, Lichtenberg explains. "Office politics is like marriage and democracy," Lichtenberg says. She explains that these are all ideals; the reality is usually a bit messier. "You can have less office politics in the corporate equivalent of fascism, so the alternative is not pleasant." Rule: Never make enemies on the way up. You'll meet them again on the way down. Here's an interesting and informative site on RSS feeds and how to incorporate them into your own site. This would be a good source for providing feeds from blog sites. Slashdot featured an article on USB wristwatches like the one pictured below from http://www.laks.com/. It is really amazing how technology progresses. CUPERTINO, Calif., May 14 /PRNewswire-FirstCall/ -- Apple?? (Nasdaq: AAPL - News) today announced that over two million songs have been purchased and downloaded from its revolutionary iTunes?? Music Store since its debut 16 days ago. Continuing the trend set during the first week, over half of the songs purchased to date were purchased as albums, further dispelling concerns that selling music on a per-track basis will destroy album sales. "Response to the iTunes Music Store has been phenomenal -- we've clearly hit a chord with users," said Steve Jobs, Apple's CEO. "We're adding new songs every day, giving music lovers even more reasons to legally download their favorite music." The iTunes Music Store lets customers quickly find, purchase and download the music they want for just 99 cents per song, without subscription fees. The iTunes Music Store offers groundbreaking personal use rights, including burning songs onto an unlimited number of CDs for personal use, listening to songs on an unlimited number of iPods, playing songs on up to three Macintosh?? computers, and using songs in any application on the Mac? ?, including iPhoto(TM), iMovie(TM) and iDVD(TM). Over 4,300 new songs were added to the iTunes Music Store yesterday, including five albums from The Doors; new featured artist Fischerspooner's album "#1" plus an exclusive remix of their hit "Emerge;" new albums from Cold, Lizz Wright, and the Yeah Yeah Yeahs; pre-release tracks from upcoming albums by Michelle Branch, Da Brat, Jesse Harris and Kenna; and, completing her catalog of music now available on the store, Alanis Morissette's albums "Under Rug Swept" and "Supposed Former Infatuation Junkie." Additionally, albums representing diverse genres of music -- from rock and alternative to jazz and classical -- were added from artists including John Coltrane, Charles Mingus, Nina Simone, Paul Oakenfold and Staind. The iTunes Music Store features over 200,000 songs from major music companies including BMG, EMI, Sony Music Entertainment, Universal and Warner so music fans can easily find the music they love or discover exclusive tracks and download them directly into their iTunes 4 music library with one-click. Songs are downloaded in pristine digital quality and can be burned onto an unlimited number of CDs for personal use, played on up to three Macintosh computers, listened to on an unlimited number of iPods, and used in other Mac applications, including iPhoto, iMovie and iDVD. NOTE: Apple, the Apple logo, Macintosh, Mac, Mac OS, iTunes, iPhoto, iMovie and iDVD are either registered trademarks or trademarks of Apple. Other company and product names may be trademarks of their respective owners. The new note features subtle shades of peach and blue and a new background. WASHINGTON (CNN/Money) - The $20 bill got a facelift Tuesday, complete with new colors, a new number arrangement and a new background, in the government's latest effort to thwart counterfeiters. 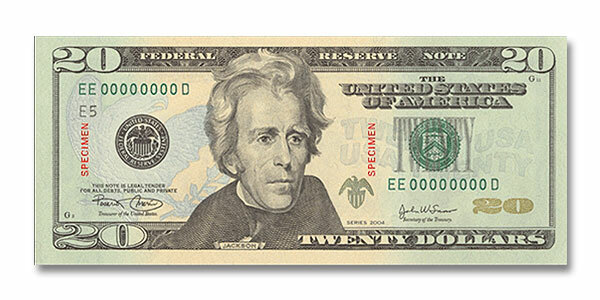 The Treasury Department's Bureau of Engraving and Printing introduced the new design, still featuring Andrew Jackson on the front but without the old circle, and a background with subtle green, "peach" and light blue hues. Other new features include small 20s in faded yellow in the background of the back of the bill. 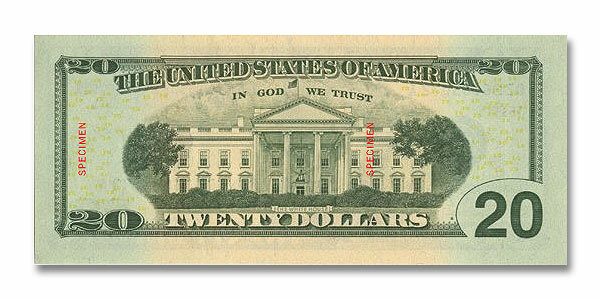 In the background of the front of the bill is a faded bald eagle and the words "Twenty USA/USA Twenty." The Treasury plans to redesign bills every seven to 10 years to keep up with technological advances in counterfeiting. "The soundness of a nation's currency is essential to the soundness of its economy. And to uphold our currency's soundness, it must be recognized and honored as legal tender and counterfeiting must be effectively thwarted,'' Federal Reserve Chairman Alan Greenspan said in a ceremony at the bureau. The last redesign of American currency was in 1996, when a new $100 bill was introduced with anti-counterfeiting features such as ink that appeared black from one angle and green from another; a watermark visible only when holding the bill up to the light; and a security strip running vertically through the bill -- features that will remain in the newest currency. Other currencies with similar features followed -- a new $50 bill in 1997, a new $20 bill in 1998, and new $5 and $10 notes in 2000. The new $20 bill will go into circulation in the fall -- most likely in October, according to Thomas Ferguson, director of the Bureau of Engraving and Printing. New $50 and $100 notes will be introduced in 2004 and 2005, each with different color schemes. New $5 and $10 notes might also be introduced. The $1 and $2 notes will not change. In the meantime, the Treasury Department is working with companies in the vending, gaming and public transportation industries to help them adjust their currency-reading devices to accept the new bills. Treasury has given these companies material they can use to update bill-acceptance devices, but nothing they can spend or use to make counterfeit bills. But some currency experts warned that the new features likely will do little to discourage counterfeiters. "Everything they've done before has been superseded by better counterfeiters," said Dennis Forgue, an anti-counterfeiting expert at Harlan J. Berk Ltd., a numismatic firm in Chicago. "With the effectiveness of computer-generated images these days, they can make some pretty nice counterfeits pretty quickly." Of all the counterfeit bills in circulation, about 40 percent are produced digitally, according to the Secret Service, which was established in 1865 to fight counterfeiting. Forgue said some counterfeiters are able to bleach the ink out of newer bills of smaller denominations, leaving just the unique currency paper and the watermark, and then print the features of a higher-denominated bill on the blank paper. "The ones I've seen have been not that great in quality, but can pass in a lot of places," said Forgue, who doubted the features of the new bill would do anything to discourage people from this process, called "leaching." The Bureau of Engraving's Ferguson acknowledged the new bill would not discourage counterfeiters from this process, but he said there would still be features that, with a quick look, could distinguish a "leached" note as counterfeit. "It will still have a different watermark and security strip. You could tell the difference in about 15 seconds," Ferguson said.